Cabrinha Kites, a subsidiary of Pryde Group Americas, of Doral, Fla., is recalling about 2,900 Cabrinha kiteboard control systems. The point of connection between the lower front line with the landing line can break, causing a loss of kite control, posing injury and fall hazards. The firm has received six reports of the stainless steel PBS component breaking. No injuries have been reported. The component subject to recall is the stainless steel POWER BRACKET SEAT (PBS) and the lower front line that connects with the landing line on the Overdrive 1X Recoil with Fireball or Quickloop, Overdrive 1X Trimlite with Fireball or Quickloop, 1X Trimlite with Fireball or Quickloop and the Chaos 1X Control system models. The stainless steel PBS is mounted on the top of the depower mainline between one of the lower front lines and the landing line. The PBS is used as a stopping point for one of the flying lines while allowing the activation of the 1X security landing line. Model numbers included in the recall are: KS7CSODFR, KS7CSODQR, KS7CSODFC, KS7CSODQC, KS7CSFXFC, KS7CSFXQC and KS7CSCHFX. 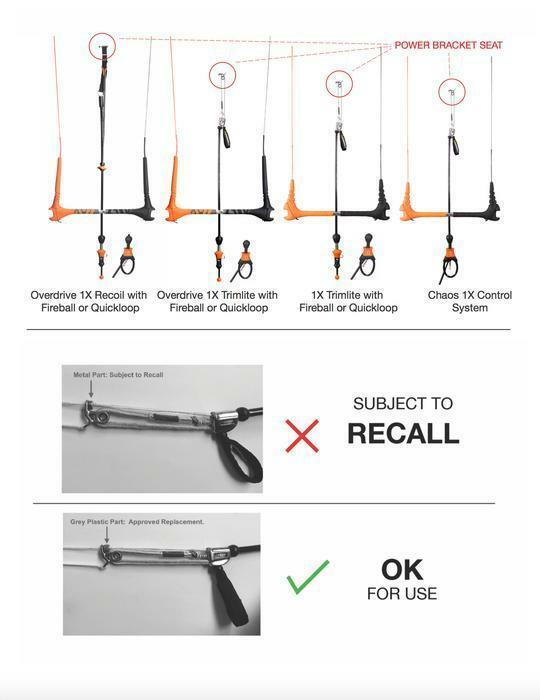 Only models with “2017 1X” printed on a cloth tab attached to the bungee line restrainers at the end of the bars are included in this recall. The control systems, manufactured in China, were sold exclusively at watersports stores nationwide from July 2016, through March 2017, for about $550. Consumers may contact Cabrinha at 808-893-0286 from 9 a.m. to 4 p.m. (Hawaii Time) Monday through Friday or online at www.cabrinhakites.com and click on the “Safety Alert” at the top of the page for more information.